When the first season of Luke Cage premiered on Netflix, it chronicled how its eponymous main character was finding his purpose for the people of Harlem, which coincidentally paralleled how the show itself would carve its own identity and stand out from its predecessors at that time, namely Daredevil and Jessica Jones. After spending the entire first season finding its footing, both the show and our hero return to the digital small screen in full force. For Luke Cage, he has become more confident in his role as Harlem’s protector after the events of Season 1 and The Defenders while working outside the flawed justice system. 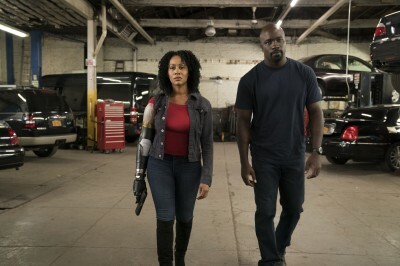 Tagging along with Cage is Misty Knight, who is forced to adjust to a new chapter in her life after losing her arm and her faith in the justice system. Now with a bionic prosthetic placed where her arm was, she joins Cage in the fight to clean up the mean streets of Harlem their own way. In the course of all this, Cage comes to blows with John “Bushmaster” McIver, who emerges seemingly from out of nowhere to take down Mariah Dillard and seize Harlem’s underworld for himself by any means necessary. The returning cast (most notably Mike Colter, Simone Missick, Alfre Woodard, and Theo Rossi) pick up right where their characters left off and haven’t missed a beat. With renewed energy and bravado in tackling their roles, they continue to give the series the weight it needed as the series progresses. As far as the new additions to the cast go, Mustafa Shakir and the late Reg E. Cathey don’t disappoint. 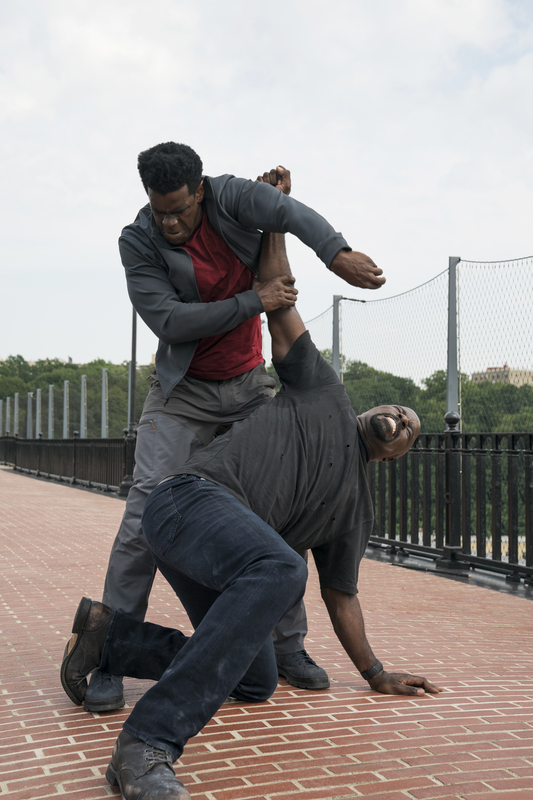 Shakir, who plays Bushmaster, shines in what could possibly be his biggest role to date. It wouldn’t be fair to compare him to Mahershala Ali’s captivating portrayal of Cornell “Cottonmouth” Stokes back in Season 1 but his performance is convincing enough for viewers to consider him a formidable foe to Luke Cage, albeit with a more maniacal edge. As for Cathey, in one of his final performances, his portrayal of Reverend James Lucas adds another layer to Cage’s character. Initially portrayed as the father whose relationship with his son was damaged after Cage was incarcerated, Cathey brings real emotion to his role as James patches things up with his son throughout the season’s course. One could say Cathey as James is a godsend (no pun intended) to the series. And once again, showrunner Cheo Hodari Coker gives music a huge role in the show, but the soundtrack for this season exudes much more confidence. The best example of this tonal shift is at the season premiere, which starts with Mobb Deep’s infamous (pun intended) single Shook Ones (Part II). Since the season premiere falls just a few days after the death anniversary of Prodigy (one-half of Mobb Deep), I couldn’t resist the urge to work this in my review. With its hard-hitting melody and raw lyrics, it’s no surprise that the track has stood the test of time as a picturesque depiction of life in the inner city. So it was apropos for the show to kick off its second season with Luke taking down gang members with this blaring in the background. If you gotta go hard with your soundtrack from the get-go, you can’t go wrong with a classic from Queens’ most dangerous hip-hop duo. Overall, with a more solid foundation, Luke Cage Season 2 is bound to make fans enjoy how the series has grown and get them “stuck on the realness”. Even in its second run, the show still has a few delightful surprises in store that would keep audiences hooked. So you best not miss this season, unless you’re a shook one.